DigiDop Vascular Dopplers - multiple options to fit your needs and budget ! he DigiDop family has multiple options to fit your needs and budget. Incredible sensitivity - upto 6x other Dopplers! Smart Recharge System - won't charge (or blow up) alkaline batteries! Unlimited 5 year warranty - ALL parts! ALL labor! Knowledgeable and supportive customer service! 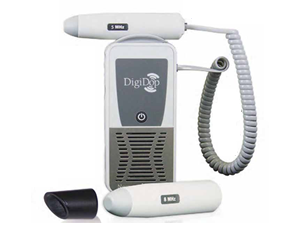 Contact us to order your Doppler or Vascular Probes today!